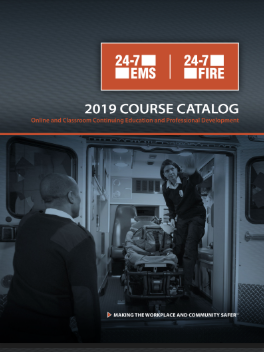 With over 100 online approved EMS CE courses for EMRs, EMTs and paramedics, and another 70 firefighter development and 15 workplace safety courses, 24-7 EMS and Fire delivers easy access and quick results for anyone needing to get continuing education on their own. Our high-quality video-based courses are affordable for both individuals and for agencies on tight budgets, and our web-based management system provides convenient online administration for agencies and departments to assign, track and report on training. Fill out the form and get your link to download our course catalog.